Purpose: To evaluate the difficulty perceived of each step of phacoemulsification and analyze the factors affecting them. Methods: Overall, 12 trainee residents were allotted 10 cases of phacoemulsification of eyes with senile cataract, under a single observer, and the steps of each surgery were rated from very easy to very difficult with a questionnaire. The completion rates of steps and complications of each surgery were noted. Principal component analysis of the responses to the difficulty level questionnaire was conducted to obtain factors resulting in the perceived difficulty. Results: The lowest difficulty scores were for initial step of incision creation (1.63 ± 0.84), followed by intraocular lens insertion (2.51 ± 0.8). The most difficult step was divide/chop of the nucleus (3.74 ± 0.97) followed by phacoemulsification (3.32 ± 0.82). Highest completion rates were seen for the initial steps of the surgery and the lowest for divide/chop. We identified two major patterns of difficulty among the trainees – one for steps involving high amount of binocularity and the other, for steps involving high precision of hand control. The rate of complication of our study was within acceptable range. Conclusion: Although trainees have practiced phacoemulsification steps on simulation, real-life situation may bring in unprecedented level of difficulty and challenges, which may be documented and used for targeted improvement of surgical skills. Stereopsis and hand control training should form a major part of training modules of cataract surgery both on simulation and real-life scenarios. Phacoemulsification has become the standard of care for cataract extraction in today's scenario and is the most commonly performed surgery in India. With the world's population aging fast, the number of cataract surgeries performed is at a rise too. Overall, 0.5 million cataract surgeries being performed in 1981 through 1982, the number in India alone has widened to 4.8 million in 2006 with a 90% intraocular lens (IOL) implantation rate. We have moved a long away from the days of large incision extracapsular cataract extraction (ECCE) to current minimal incision phacoemulsification surgeries with the surgeries demanding an extreme level of perfection and expertise and also a certain level of comfort and freeness with the technical usage of machines. It is of paramount importance that the centers for ophthalmological teaching lay stress on improving the teaching methods of phacoemulsification for today's trainees to become world leaders in future. A lot of studies till now have concentrated on the visual outcome and complication rates as the measure of a successful surgery and training per se. The learning curve for phacoemulsification is quite steep and a number of simulation training programs have been developed to increase skill levels of trainees in each step of phacoemulsification. However, in spite of simulation training, trainees face number of difficulties in the real-life surgical scenario, and hence, this study was designed in order to evaluate the perceived difficulty of each step of phacoemulsification during initial training phase in a real-life scenario and analyze the data using a principal component analysis model to determine the pattern of difficulty faced. Principal component analysis is used in exploratory data analysis for building predictive data models. To the best of our knowledge, this work is a first of a kind study. This prospective cross-sectional study was performed at a tertiary care center in New Delhi and included 120 consecutive phacoemulsification surgeries, 10 surgeries each performed by 12 junior residents as primary surgeons from October 2016 to February 2017 under the supervision of a single senior resident surgeon (MP). The study adhered to the tenets of the Declaration of Helsinki and a written informed consent form was signed by each patient for surgery. Surgeries were appointed to trainees only if they had performed at least 10 large incision extracapsular cataract surgeries and fulfilled the minimum requirement of 4–6 h of weekly practice of simulated phacoemulsification at the Institute wet laboratory. Each trainee had also completed a basic microsurgical skill training course. The surgery was divided into the following steps: incision, rhexis, hydro procedures, dividing and chopping of nucleus, phacoemulsification, cortex irrigation/aspiration, IOL insertion, and wound closure. Each trainee was given a questionnaire to fill at the end of each surgery. 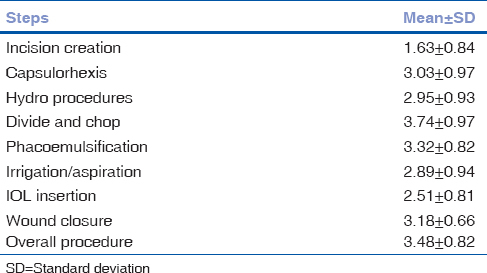 They had to rate these steps on a scale of 1–5 with 1 being “not difficult” to 5 as “extremely difficult”. All the surgeries were recorded. A third party independent observer, blinded to both the trainee and the supervisor, was appointed to rate each step of the surgery as 1 (completed fully by trainee) or 0 (taken over by the supervisor) and record it in the questionnaire. Also, the observer would observe the videos to look for complications in the surgery which would be recorded later within the questionnaire. The aim of the study was to identify the steps at which the resident trainees were facing maximum amount of difficulty in spite of getting trained adequately on the simulations. Patients having age related LOCS III (Lens Opacity Classification System III) nuclear opacification grades 2–3 cataracts were considered for the inclusion in the study. Patients with presenile cataract, complicated cataracts, or post-traumatic cataracts were excluded from the study. Patients with other ocular comorbidities, such as uveitis, angle closure glaucoma, pseudoexfoliation syndrome, subluxated lenses, presence of corneal opacity, Fuch's endothelial dystrophy, etc., were excluded from the study. All surgeries were performed under peribulbar anesthesia through a temporal approach with lignocaine 2% and bupivacaine 0.75% mixed in 1:1 concentration along with Hyaluronidase 7.5 IU/mL. A clear corneal incision was made with a 2.2 mm single-bevel keratome (Alcon Laboratories, Inc. Fort Worth, TX). Two-side port incisions were made with the help of microvitreoretinal blade (Alcon Laboratories, Inc.) and Healon (Pharmacia Upjohn, Kalamazoo, MI) was injected to form the anterior chamber. After staining anterior capsule with Trypan Blue dye, a 5- to 5.5-mm continuous curvilinear capsulorrhexis was performed with the help of capsulotomy needle and hydrodissection and hydrodelineation were performed with balanced salt solution (BSS). The lens nucleus was then divided into two pieces and then chopped into smaller pieces. All eyes underwent torsional phacoemulsification (Ozil Intelligent Phaco Technology) using Infiniti vision system (Alcon Laboratories, Inc.). The parameters were set as bottle height of 110 mm, vacuum of 330 mm Hg, and the aspiration flow rate of 33 cc/min. A stop and chop technique was used to divide the nucleus. After emulsification of the nucleus, the cortical matter was removed with the help of irrigation-aspiration (I-A) probe. A foldable hydrophilic acrylic single-piece intraocular lens (Acryfold IOL; Appasamy Associates, Chennai, India) was inserted and placed within the capsular bag with the margin of the capsulorhexis covering the IOL optic all around. The IOL was injected with the help of manual injector. Viscoelastic was removed from the anterior chamber with I-A probe. Statistical analysis was performed using SPSS version 20.0 (IBM). Descriptive statistics was used to show the scores and completion rates of steps of phacoemulsification. Factor analysis was performed using Principle component analysis with Varimax (orthogonal) rotation. During a 1-month period from July to December 2016, 12 trainees performed 10 consecutive cases of phacoemulsification under supervision of a senior resident surgeon. The mean age of the patients was 61 ± 3.78 years and the grade of cataracts was nucleus sclerosis grades 2–3 (LOCS III). Peribulbar anesthesia was given in all the cases. At the beginning of the study, all residents had performed basic microsurgical skill training course and simulated phacoemulsification course. [Table 1] and [Table 2] display the mean and median difficulty scores and completion rates of each stage. The lowest difficulty scores were for initial step of incision creation (1.63 ± 0.84), followed by IOL insertion (2.51 ± 0.8). The most difficult step was divide/chop of the nucleus (3.74 ± 0.97) followed by phacoemulsification of nucleus (3.32 ± 0.82). Both these steps were significantly more difficult compared with the rest of the steps (P < 0.05) and divide/chop was significantly more difficult than phacoemulsification (P < 0.05). Likewise, lowest completion rates were found for divide/chop (61.67%) and phacoemulsification (67.5%) of the nucleus. Highest completion rates were present for incision creation (100%), intraocular lens insertion (77.5%), and capsulorhexis (75.8%). Of these steps, capsulorhexis was perceived moderately difficult with a score of 3.03 ± 0.97. The eight questions related to phacoemulsification steps were factor analyzed [Table 3] using principle component analysis with Varimax (orthogonal rotation). KMO and Bartlett's test of Sphericity indicated that the variables were adequately related for factor analysis (P < 0.001). The analysis resulted in three factors, explaining a total of 68.386% of the variance for the entire set of variables. 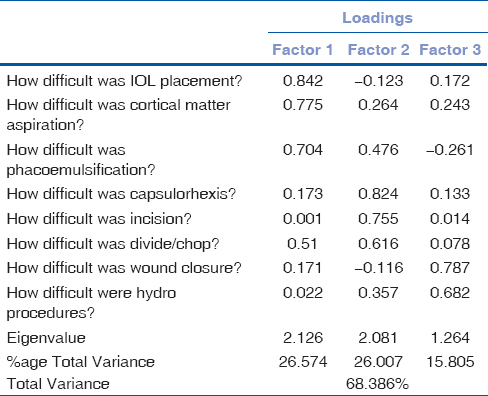 Factor 1 had high loadings for IOL placement, cortical matter aspiration, and phacoemulsification, and this factor explained 26.574% of the variance. Factor 1 was named “steps involving high amount of binocularity.” The second factor consisted of capsulorhexis, divide/chop, and wound incision, and this explained 26.007% of the variance. Factor 2 was named “steps involving high precision of hand control.” A third factor containing wound closure and hydro procedures explained 15.805% of variance and was named “BSS handling (minimal hand manipulation).” Thus, we identified three clear patterns of difficulty among the trainees: the first pattern for steps involving high amount of binocularity, the second for steps involving high precision of hand control, and the third for steps involving BSS handling. These three steps were found independent of each other. The common complications documented were 22 cases of Descemet's membrane detachment (18.3%), 13 cases of posterior capsular (PC) tears (10.8%), 10 having vitreous loss (8.3%), and 29 cases of postoperative corneal edema (24.17%). Eyes with vitreous loss required proper anterior vitrectomy, which was performed by the supervisor in the same sitting. All cases with PC tears received a three-piece IOL in the sulcus. Nine eyes had nuclear material drop (7.5%), which were followed up under the supervisor for further management. Other uncommon complications that occurred were iris prolapse (5%), radial tears of rhexis (5%), and one case of zonular dehiscence. In the case with radial extension of rhexis, the IOL placement was carefully performed by the supervisor. In the zonular dehiscence case, the supervisor converted the surgery into ECCE and completed with anterior vitrectomy and IOL in sulcus. In total, two eyes had to be converted into ECCE. Phacoemulsification has a learning curve, at the end of which the trainee attains a significantly higher completion rate and a lower complication rate than before. Every surgeon has to go through this training phase and it is the prerogative of the residency training program to train the young surgeons of the future. Traditionally, training programs have focused on giving the trainees an exposure to substantial number of ECCEs before moving on to phaco training in fear of a higher complication rate., However, there have been studies where prior ECCE experience was not a requirement for starting phaco with good visual acuity outcome and low complication rate. Generally, training programs are designed so that trainee performs parts of the phaco surgery under supervision several times in order to gain confidence and perfection in the basic steps and then is encouraged to continue individually. However, the program at our center focuses on encouraging trainee to sit as primary surgeons with an experienced senior resident as assistant who supervises the trainee and guides him/her through every step and complication. The emphasis is always on completion of each step satisfactorily before moving on to the subsequent step. However, in this study, we did not rate each step. Moreover, the supervisor lays higher stress in perfecting the later steps like phacoemulsification, cortical aspiration, etc., as they are more crucial and decide the further course of the surgery. Trainees are more or less acquainted with the initial steps as they might have performed them independently during the extracapsular surgeries. There was a 35.8% completion rate of the overall surgery, with the supervisor taking over the step where difficulty was faced the most, although the lowest stepwise completion rate was 61.67% for divide/chop of the nucleus. This may have been because these were the initial cases of the training curve, and although individual stepwise completion was more than 60% for all, very few trainees could perform all the steps completely in all the cases. However, it was observed that the number of steps performed independently increased with the successive surgeries. As would be normally expected, the external steps of the surgery were perceived as easier than the intraocular steps involving the nucleus and IOL handling, involving finer hand movements and stereopsis. Dividing the nucleus and chopping into pieces was perceived as the most difficult step, accompanied with the lowest completion rate. One explanation may have been that the supervisor would take over from the trainee at the slightest bit of hesitation at this step, considering dividing the nucleus properly into segments to be a crucial step for completion of phacoemulsification effectively avoiding posterior capsular trauma. The most dreaded complication of a phaco surgery is posterior capsular tear and vitreous loss, which may alter the choices of placement of the intraocular lens and may also lead to nuclear matter drop into vitreous. Studies have shown that resident performed phaco surgeries with vitreous loss may also have good visual outcome and that trainees can be taught phaco with a reasonably low overall complication rate., The rate of posterior capsular tear among trainees has been reported to be from 5.8% to 15%. Experienced surgeons tend to have much lower complication rates, with a vitreous loss rate of 0.53%–1.63% compared with 2.8%–10% in trainees. The rate of complication of our study was within the acceptable range and whenever a complication arose, the trainee would be properly instructed step by step to handle the same or the case would be overtaken. The trainees were counselled regarding the occurrence of complications and were allowed to proceed only if they were comfortable enough to tackle the next steps. This way any chance of false increase of complication rate or increase in perceived difficulty of steps was avoided. However, the trainees in our study were mostly at the early stage of their careers, and the complication rate may be slightly higher compared with experienced surgeons at this phase of learning of phacoemulsification. Chance of phacoemulsification complications has been shown to reduce at a rate of 1% in every successive case during training, mostly because of increasing experience and avoidance of fear toward complications as training progresses. Principle component analysis led us to divide the reasons for perception of difficulty into three factors, related to steps involving precise hand control, steps with BSS handling (minimal hand manipulation), and steps involving high amount of binocularity. Of these, steps involving precise hand control and binocularity were found to have a higher contribution to the variance. The important point in this regard is that phacoemulsification demands a significant level of stereopsis and binocularity, which needs to be tested in anyone wishing to pursue a microsurgical career, since surgical outcomes are directly related to these attributes. Moreover, in spite of extensive capsulorhexis and chopping training on simulators, the difficulty faced by the trainees was exceptional in the real-life scenario. In their initial phases, trainees are not able to assess the depth of the trench and are also afraid of going too deep while trenching near the posterior capsule. If the depth of the trench is not sufficient and there is a premature effort at dividing the nucleus, it would be difficult to separate the nucleus, which will make the further steps of division and emulsification of the nucleus difficult. Unfortunately, simulator training cannot recreate the real-time intraoperative conditions, and thus, trainees need to focus on repeated observation of these steps by an experienced surgeon during a live surgery or through surgical videos. Training programs need to focus on these steps involving fine movements and depth perception by concentrated training of these steps in patients, alongside appointing entire supervised cases to them. Simulator training seems to be important in developing the orientation of trainees toward the steps; however, high performance in simulators may not be sufficient in developing acumen in live surgery scenarios. Difficulty in intraocular manoeuvres may also arise because the nondominant hand is not well trained. Since the steps require good dexterity and equal participation of the nondominant hand, the training programs should also look at training the nondominant hand of the trainees through exercises and activities. A limitation of our study was that a limited number of surgeries of each resident trainee were recorded for inclusion in the study. Hence, we could not perform a longitudinal analysis to determine the number of surgeries required to minimize the complications and achieve higher completion rates by trainees and a future study may be designed to obtain the same, based on which it can be indicated the minimum number of surgeries to be appointed by training programs to each trainee to maximize the output of their training periods. Phacoemulsification learning curve in trainee surgeons is a steep one with higher complication rates than experienced surgeons, although outcomes of surgery may be comparable. Generally, conventional training methods have focused on measurement of outcomes. Trainee surgeons have different levels of perceived difficulties in the various steps of phacoemulsification surgery, mostly involving steps of very fine hand movements and intraocular depth perception. Training modules should focus specifically on strengthening fine hand movements and stereopsis of learners for better outcomes. It is a known fact that some residents are fast learners and have inherently better surgical skills than others who take longer time to develop the same amount of skills. Hence, a better way of evaluation would be to analyze the subjective difficulties faced by trainees in an individualized manner and modify the training/simulation needs according to the learning capability of the particular trainee. Aravind S, Haripriya A, Sumara Taranum BS. Cataract surgery and intraocular lens manufacturing in India. Curr Opin Ophthalmol 2008;19:60-5. Corey RP, Olson RJ. Surgical outcomes of cataract extractions performed by residents using phacoemulsification. J Cataract Refract Surg 1998;4:66-72. Zhang Z, Castelló A. Principal components analysis in clinical studies. Ann Transl Med 2017;5:351. Badoza DA, Jure T, Zunino LA, Argento CJ. State of the art phacoemulsification performed by residents in Buenos Aires, Argentina. J Cataract Refract Surg 1999;25:1651-5. Smith JH. Teaching phacoemulsification in US ophthalmology residencies: Can the quality be maintained? Curr Opin Ophthalmol 2005;16:27-32. Quillen DA, Phipps SJ. Visual outcomes and incidence of vitreous loss for residents performing phacoemulsification without prior planned extracapsular cataract extraction experience. Am J Ophthalmol 2003;135:732-3. Albanis CV, Dwyer MA, Ernest JT. Outcomes of extracapsular cataract extraction and phacoemulsification performed in a University training program. Ophthalmic Surg Lasers 1998;29:643-8. Blomquist PH, Rugwani RM. Visual outcomes after vitreous loss during cataract surgery performed by residents. J Cataract Refract Surg 2002;28:847-52. Hennig A, Schroeder B, Kumar J. Learning phacoemulsification. Results of different teaching methods. Indian J Ophthalmol 2004;52:233-4. Robin AL, Smith SD, Natchiar G, Ramakrishnan R. The initial complication rate of phacoemulsification in India. Invest Ophthalmol Vis Sci 1997;38:2331-7. Selvander M, Asman P. Stereoacuity snd intraocular surgical skill: Effect of stereoacuity level on virtual reality intraocular surgical performance. J Cat Refr Surg 2011;37:2188-93.